Take the classic outdoor experience with you when you're lighting the way with a Coleman Two Mantle QuickPack™ Lantern. Find just the right light with an adjustable knob that allows you to dim the brightness level from its highest at 967 lumens to as low as you need it. Take this lantern with you in any weather; EverBrite™ Power will give you incredible light in any condition, anytime. Take the classic outdoor experience with you when you&apos;re lighting the way with a Coleman Two Mantle QuickPack™ Lantern. Find just the right light with an adjustable knob that allows you to dim the brightness level from its highest at 967 lumens to as low as you need it. Take this lantern with you in any weather; EverBrite™ Power will give you incredible light in any condition, anytime. One of the reasons for that is the PerfectFlow™ System that feeds the lantern consistent fuel, no matter the conditions. A high-temperature globe and durable porcelain-coated ventilator offer quality that will have you lighting this outdoor companion season after season. One 16.4-oz. 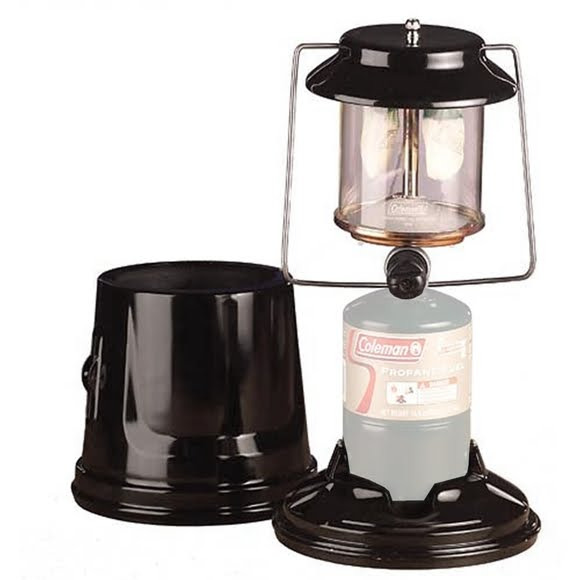 propane cylinder (sold separately) will power the lantern for up to 7.5 hours on high. The mantles are pre-installed. The lantern comes with a 5-year limited warranty and a cover for easy packing and storage. Propane cylinder shown in photo is sold separately.